Vigee Le Brun's sister-in-law, Suzanne Marie Francoise Vigee (1764-? ), was the third of seven children born to Jean Baptiste Riviere (1737-1826) and his wife, Catherine Antoinette Foulquier (1739-1826), a former actress and dancer of the Comedie Italienne known by her stage name of La Catinon. The Riviere family was of French origin, its members attached to the courts of Germany, especially that of Saxony. Jean Baptiste Riviere was charge d'affaires in Paris of the Elector of Saxony; he occupied this post for some fifty years. Vigee Le Brun's close relationship with the Riviere family is attested throughout the Souvenirs. In the summer of 1789, she recovered from nervous exhaustion at the home of Jean Baptiste Riviere on the rue de la Chaussee d'Antin. Between 1792 and 1801, she was accompanied in her travels by Suzanne's oldest brother, Auguste Louis Jean Baptiste (1761-1833), an accomplished painter who copied in miniature many of Mme Le Brun's portraits. Suzanne Vigee was a talented pianist, singer, and amateur actress (Souvenirs 1, 94) and was often called upon to perform at her sister-in-law's musical soiries. 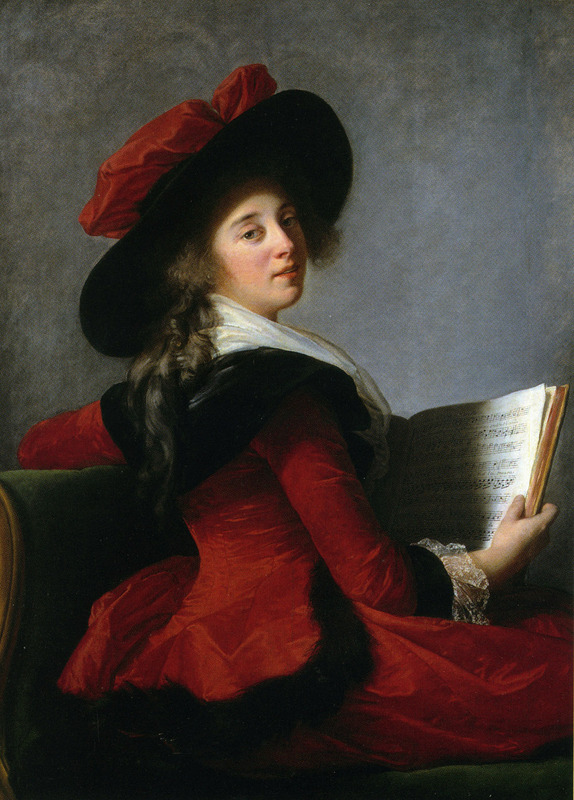 Vigee Le Brun stressed the plainness of Suzanne Vigee's looks. Apparently her only attractive feature was her large eyes (Souvenirs, 1, 99), which in this portrait are made even more impressive by the dramatic twist of her body, a pose repeated in the portrait of the Comtesse de Chastenay (cat. no. 17) and to some extent in that of the Baronne de Crussol (fig. 14). The black satin scarf is identical to the one worn bv the artist in her Self-Portrait, aiix rtibans cerise (cat. no. 11), the Chapeau de paille (fig. 7), the Duchess de Polignac, 1782 (Polignac Collection) and the Lady Folding a Letter, 1784 (cat. no. 15). Suzanne and Etienne Vigee had only one child who survived infancy, Charlotte Louise Elisabeth (1796-1864). Caroline, as she was called, would one day marry her mother's youngest brother, Jean Nicolas Louis Riviere (1778-1861), a diplomat like his father in the service of Saxony. They and their children lived with Mme Le Brun at the end of her life and at her death inherited the bulk of her estate. PROVENANCE: Collection of Caroline	collections of Caroline Riviere, nee Vigee; by family descent to the present owner. EXHIBITION: Tours, Musee des Beaux-Arts. L'Art dans les collections privees de Touraine, July 12-September 20, 1959, no. 52, illus. pl.21.